Periodontal literally means 'around the tooth'. 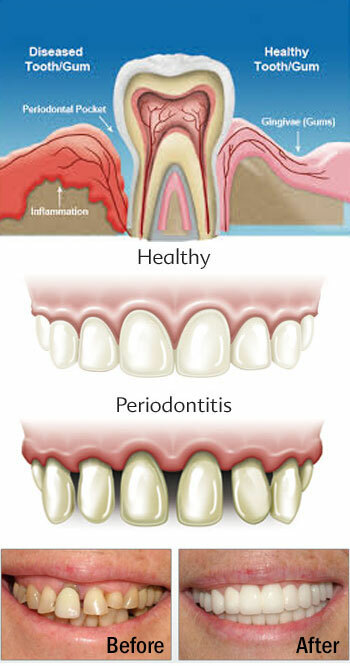 Periodontal disease attacks the bones that support the teeth as well as the gums. Plaque is a sticky film of food debris, bacteria, and saliva. If plaque is not removed, it turns into calculus (tartar). When plaque and calculus are not removed, they start destroying the gums and bone. Periodontal disease is characterized by red, swollen, and bleeding gums. A number of people suffering from periodontal disease are not even aware of it! This is because the disease is usually painless in the early stages. Dental curettage is a procedure in which diseased tissue is removed from the gums and mouth. Gum curettage is a common technique used to manage periodontal disease. In basic dental curettage, a sharp cutting instrument is run into gingival pockets in front of the teeth to remove dead tissue, and dead or infected tissue will be removed from the gums. A local anaesthetic is often used to make the patient more comfortable, and the mouth is frequently flushed with a sterile solution to sweep out the debris. This procedure is usually provided to people with advanced gum disease as a tool for managing the problem, and it may be required on multiple occasions. Not only is periodontal disease the number one reason for tooth loss, research suggests that there could be a link between periodontal disease and other diseases such as, stroke, bacterial pneumonia, diabetes, cardiovascular disease, and increased risk during pregnancy. Researchers are determining if inflammation and bacteria associated with periodontal disease affect these systemic diseases and conditions. Smoking also increases the risk of periodontal disease. Good oral hygiene, a balanced diet, and regular visits to the dentist can help reduce your risk of developing periodontal disease. In preference to curettage, some dentists prefer to do perform what is known as a 'deep cleaning', otherwise known as a scaling and root planing. Studies have suggested that deep scaling and root planing may be just as effective, especially when it is done at an early stage. In this procedure, built-up calculus is removed from the teeth with hand-held instruments, and the roots of the teeth are smoothed so that they do not provide a surface for plaque to build up on. Several sessions are often required, and patients may be given anaesthetic so that they feel more comfortable, since the procedure can be mildly painful. At Sterling Dental Clinic, we are committed to the highest level of periodontal excellence. Our team is friendly, courteous, and always ready to assist you in any way.